In his book, Michele Metta has provided his readers with a glimpse into the world of Centro Mondiale Commerciale (CMC). But along with that, the author gives us an insight into the politics of post-war Italy that is quite encompassing and incisive. It’s very clear that Italy was a hard target of American interests in the Cold War. With the help of some books published in Italy that would not normally be available to an Western audience, Metta takes us further into those attempts to control Italian politics. Centro Mondiale Commerciale came to the attention of Jim Garrison’s investigation into John F. Kennedy’s assassination because Clay Shaw, the man he would accuse of participating in a plot to murder Kennedy, was a member of its board of directors. As more than one author had noted, that shadowy corporation had a rather curious background prior to opening in Rome amid much hoopla. They had previously been thrown out of Switzerland due to the controversial nature of some of its members, and also due to the mystery surrounding the company’s financial backing. The charge made by Garrison against Shaw is one of the reasons why there is so much discussion on the internet about CMC, located in Rome Italy, and its associated company Permindex, located in Basel, Switzerland. The discussion has also included much unreliable and/or unverified information that is rooted in accusations made by Lyndon Larouche’s Executive Intelligence Review (EIR) and David Copeland, aka William Torbitt, who wrote Nomenclature of an Assassination Cabal. This includes stories depicting Permindex as a front company operated by Montreal lawyer, Louis M. Bloomfield, from which Bloomfield supervised assassinations. These stories have been circulating for many decades and for some people these stories about Bloomfield and Permindex are considered as fact. When I discovered that an Italian journalist, Michele Metta, had done research on CMC, I was hopeful. Finally, a study of this company that would not build on the falsehoods created by Larouche and Copeland, and instead would provide the reader with a narrative supported by actual evidence. What I found however, was a bit of both. Metta provides evidence that actually proves that Shaw was on the board of directors of CMC, that CMC member Ferenc Nagy was a CIA asset, and that another CMC member, Georges Mandel, aka Giorgio Mantello, was connected to Israeli intelligence. The author further describes connections between CMC and the notorious Italian organization, Propaganda Due (P2), that is linked to the “Strategy of Tension” that was responsible for a wave of bombings and violence in Italy. He also provides connections to persons involved in Kennedy’s assassination. But the book falls short in another aspect of its story. Metta attempts to link CMC to the “Strategy of Tension” and the assassination of John F. Kennedy. Although he makes some interesting connections in those regards, he does not really achieve his aim. The book however does an excellent job at showing connections. Metta’s research links many members of CMC to Mussolini’s old fascist guard and neo-fascists associated with the “Strategy of Tension.” He does this by providing names of CMC members and then describing their personal histories. He demonstrates that these ardent cold warriors dreaded socialist and communist parties controlling the Italian government, and were prepared to go to great lengths, including violence, to stop them from achieving power. These are the same people who would also oppose Kennedy’s soft-on-communism foreign policy, including his conciliatory attitude towards leftists in the Italian government. 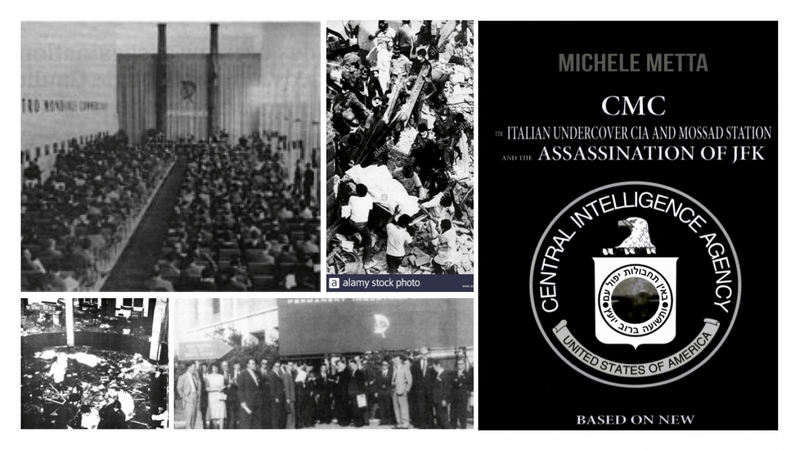 These numerous right-wing connections to CMC make it apparent that it could be used as a vehicle for promoting subterfuge in Italian politics and perhaps even play a role in Kennedy’s assassination. But connections alone do not constitute proof. The fact that one person knows another, and that person is somehow connected to CMC is not proof that CMC played a role in the Dallas plot. These numerous right-wing connections, however, create a lot of suspicion about this company’s activities, a suspicion so great that it demands further investigation into its operations. It also shows that Garrison’s interest in the organization was merited and that later attempts to somehow demonstrate that this was all a KGB disinformation ploy are not founded. But more research is needed to provide the actual details of how CMC participated in Kennedy’s assassination. Metta does not provide this important evidence. For example, when he attempts to link the financing of the plot to Valerio Borghese and CMC, he offers only more connections, instead of how money went into CMC’s bank account and then out to the assassination team. The author informs us of other events he tries to link to the members of the CMC: for example, interfering with President Jimmy Carter’s re-election bid in 1980 and an assassination attempt on his life. He also tries to tie CMC to the assassination of Italian politician, Aldo Moro, in 1978. But again Metta offers only connections between people as proof that CMC played a role in these events. Before examining his book in more detail, we must first examine the question mentioned earlier: why all the interest in CMC/Permindex, and why it has continued to be a topic of interest for Kennedy researchers for such a long time. But is the pact subversive? To many people, including this reviewer, it looks like typical election politics: encouraging a certain ethnic group to vote a certain way. The fact that it stemmed from a foreign country, Italy, is also not that unusual. Giuseppe Pièche, who organized the above-mentioned anti-Kennedy pact, also provides a link between CMC and far-right Italian politics. This connection is important because CMC has always been a suspicious entity, the suspicion being that the company owed its existence to a motive other than profit. And Metta does provide the reader with reasons to be suspicious. Pièche was a general in Mussolini’s army. If this isn’t enough of a fascist credential, Metta goes on to state that he and Mario Scelba “created and directed” the Servizio Antincendio [Fire Service]. He was assisted in the Fire Service by Edgardo Sogno who was connected to P2 and who later told the press that the Fire Service was a NATO organization linked to the Gladio network. (p. 13.4) The author also informs the reader that Pièche and Sogno created and ran an organization called “Pace e Libertà” [Peace and Freedom], which received funding from Allen Dulles. (pp. 14-15) These are credentials that should make any reader be wary. But then Metta makes a strained conclusion. He states that Pièche was a member of the CMC Board of Directors; that Antonio Trabuchi, who was present at the signing of the Freemasons’ pact, was a also a member of the government led by Fernando Tramboni, who wanted to make Italy into a dictatorship (pp. 9, 15); and finally, that Tramboni’s son-in-law, Franco Micucci Cecchi, was also a member of CMC (p. 15). From these facts he concludes: “Therefore, there is ample evidence so far to sustain that CMC was behind the pact against JFK.” (p. 15) Yet, he has already told us that the pact against Kennedy was between American and Italian Freemasons. (p. 9) If CMC was the catalyst for the pact, he should have demonstrated how CMC’s board of directors had created and implemented it. Point 1. Program diverse actions for possible emergency situations. Point 2. Intensify finances to the forces which oppose the political swing [to the left]. Point 3. Support single leaders in the Christian Democratic Party (DC) and political lobbies willing to rally around the new President of the Republic Antonio Segni (Segni, like Gronchi before him, placed full trust in General De Lorenzo), who did not like the party’s opening to the left. Point 4. Support any action which seeks to weaken the structure of the Socialist Party and favor any kind of internal split. Point 5. Strengthen voices in the media who are able to influence public opinion in the field of economics and politics. Metta does however create some suspicion about CMC’s connections to the Masonic Lodge P2. P2 was, according to the author, linked to the “Strategy of Tension,” which was responsible for much violence in Italy, including the Bologna railway station massacre that killed 85 people and injured over 200 people in 1980. The goal of these attacks was to terrorize the Italian public into accepting an authoritarian government. (p. 21) Led by Licio Gelli and financier Michele Sindona, P2 was declared by the Anselmi Commission to be a criminal organization. P2 was a remarkably dangerous and secret society. Their influence extended beyond Italy, as far away as Argentina. As a result of the Anselmi Commission, it was eventually outlawed. This is important evidence. It certainly creates a link between P2 and CMC’s subsidiary IAHC, and therefore to CMC itself. Sharing the same offices is similar to the situation Lee Harvey Oswald found himself in, sharing office space with Guy Banister at 544 Camp Street in New Orleans. But while this is evidence of possible collaboration between CMC and P2 through its subsidiary, IAHC, it does not prove conclusively that CMC is indistinguishable from P2. Metta is relying on a connection, and while that is important, it does not tell the reader what subversive activities IAHC participated in. Although this is definitely a step forward in describing CMC, more research is needed to show how IAHC participated in P2 operations and how it participated in the Dallas plot. Metta also tries to explain to the reader another aspect of the assassination plot; how it was financed. His attempt to link Valerio Borghese to the Dallas plot gets mired in a large number of connections. It does create suspicion that certainly warrants further research, but does not prove that CMC was somehow connected to Kennedy’s murder. Borghese was a naval officer under Mussolini. After the war he was rescued and then mentored by James Angleton. Nicknamed the Black Prince, he became a hardline fascist political figure in postwar Italy. He took part in an attempted coup in 1970. After it failed, he fled to Spain where he lived out the last years of his life. Though some have doubts about Hemming, if this is all accurate, it does look sinister. Shaw, the accused Kennedy plotter, knows Borghese’s cousin. Money is disappearing from a bank controlled by Ramfis Trujillo, who Hemming accused of meeting in Haiti to finance the Dallas plot. These are certainly interesting links; but there is a problem. Metta does not tell us how CMC participated in the financing of the assassination. Yes, Shaw was on CMC’s board of directors and Gronchi is connected to CMC, but what exactly did CMC do to facilitate the financing of Kennedy’s murder? These connections between SFI, Credicomin, Borghese, Trujillo and Shaw also do more to implicate Credicomin than CMC in Kennedy’s assassination, because money disappeared from a Credicomin bank account, not from CMC’s bank account. There are now three persons linked to Permindex and CMC—Nagy, Shaw and Mandel—who have or had intelligence connections. It is getting harder to believe that this company’s only purpose was commercial. But once again it must be said that these intelligence connections alone do not support Metta’s theory that CMC played a role in the Dallas plot. What is needed is evidence that the intelligence assets used CMC as a conduit to carry out the plot. In his narrative Metta tries to link the Organisation de l’Armée Secrète (OAS) to Kennedy’s murder and CMC. The challenge here is to see if he offers proof that the OAS, the same organization that was behind assassination attempts on Charles de Gaulle, was involved in Kennedy’s murder, and then connect the dots to CMC. The Souetre presence in Dallas on November 22, 1963 has always been fascinating, for more than one reason. For instance, the OAS had been bitterly opposed to Kennedy since 1957, when he advocated for Algerian independence. Metta does make a connection between the OAS and Tamborini, but this connection is attenuated because the SISMI paper qualifies the identification of Tamborini’s office with “probably”. He then attempts to connect the OAS to CMC using Tamborini’s son-in-law but does not provide evidence to show how Cecchi involved CMC in the Dallas plot. Again, this is new and interesting evidence, but it does not go as far as it should in the details. But connections are a double-edged sword. Connections can draw the attention of the reader to important relationships between members of the CMC and fascists, and perhaps even to the Dallas plot because the likely suspects were members of the far-right. But connections alone are not enough, because they do not show the crucial details of how Kennedy was murdered: who gave the orders, how the plot was organized, how the snipers were recruited, and what role CMC played in this tragic event. Metta does make an interesting connection between the P2 and CMC subsidiary IAHC, but this needs more work because he does not tell the reader what subversive activities it was involved in. He also fails to show the reader how CMC was used as a conduit in the Dallas plot. For example, he attempts to link the financing of the assassination to Borghese, Trujillo, Credicomin, Shaw and CMC, but here again we have that double-edged sword. These connections are interesting: missing money, Shaw on the board of directors of CMC and Shaw with Borghese’s cousin’s telephone number. But he does not show how the money went from Credicomin’s bank account to CMC’s bank account and from there to the actual plotters. These connections do raise suspicions, and they should be investigated further. But by themselves they do not prove that CMC acted as financier for the Dallas plot. He also provides evidence to establish that there were at least three people, Nagy, Shaw and Mandel, who were connected to intelligence agencies. This is important because it confirms the suspicions of the newspaper Paesa Sera that there was more to CMC than just providing exhibition space for companies to sell their products. Metta also includes CMC links to events that occurred after the assassination. He attempts to connect CMC to election meddling by participating in a plot to scandalize President Carter’s brother and to an attempt on Jimmy Carter’s life. He also tries to connect CMC to the murder of Aldo Moro, but CMC’s alleged role in these two events does not inform us about the events of 1963 in Dallas. Metta’s book also has a problem with its format: the book does not have an index. This creates a lot of difficulty for the reader because so much of what the author writes about is connections. Attempting to follow the histories of different persons mentioned in his book is difficult without knowing on which pages a person is mentioned. This requires the reader to re-read whole sections of the book to locate information about an individual and this is frustrating. Particularly for a reviewer. Hopefully, this will be improved in a later edition. In 1978, Montreal attorney Louis M. Bloomfield donated his personal papers to Library and Archives Canada (LAC). His papers contained a wide variety of items, including a large number of his letters, articles and manuscripts written by him, including photographs. A complete list of what he donated to LAC can be found in the archives finding aid. (Exhibit 3)7 When he donated his papers to LAC he stipulated that all items donated by him were to be released to the public, without any restrictions whatsoever, 20 years after his death. In the intervening years, between the time of his death and the papers’ release date, his wife, Mrs. Justine Cartier, now remarried, would act as literary executrix. Her control of the documents would cease 20 years after his death. As a result of his actions, Philipps was finally able to review some of Bloomfield’s papers. He created a website called “I Have Some Secrets for You” in which he provided copies of letters written by Bloomfield in regard to his work with Permindex. Philipps discovered some interesting communications in this first release, specifically between Bloomfield, Permindex and David Rockefeller. Apparently, Ferenc Nagy was trying to solicit funds for Permindex from one of the richest men in America. There was also a CIA connection since Nagy had invited the Agency to use this new company in Rome for any purposes it wished. There is more, as the reader can see by clicking through to his web site. I began my own research into Bloomfield’s papers in 2012. The examination began with those files that were already open and then continued with those papers that could only be reviewed after they were 50 years old. This required me to return to LAC as different papers, which had reached 50 years of age, were opened by LAC for review by the public. I accessed them on a number of occasions, and as late as 2017 had been granted access to them. In January 2018, I asked for those papers that were now available for review and was told by the archives that they could not be viewed by the public. The reason given by LAC was that those files were considered to be covered by SCP. In an email from Guy Berthiaume, Librarian and Archivist of Canada, he stated that it was not Mr. Bloomfield’s prerogative to donate his legal papers to the archives because SCP protects communications between a lawyer and his client from being divulged to the public. In response to this decision by LAC to not release his papers to me I submitted an “Application for Judicial Review” to the Federal Court of Canada asking the Court to review the archive’s decision.10 In my case I argued that Bloomfield’s papers were not subject to SCP because they did not meet the legal test for privilege that can be found in Canadian case law. The archive agreed to do a second review of those files they deemed to be subject to SCP. They subsequently released over 2,000 documents to me and held back just 69 documents. The archives also agreed to update the access forms on their website so future researchers would be aware that, except for the 69 documents held back by them, his papers can now be accessed without waiting for them to reach 50 years of age. But what would cause the archives, after two previous court cases, to again try to block public access to Bloomfield’s papers? I do not have a definite answer to this question but do have a theory. The most likely cause of this problem was the October 2017 release of Kennedy assassination documents as stipulated by the Assassination Records Review Board in Washington. The release of these documents is rooted in the decision by the United States government, taken in the 1992 President John F. Kennedy Assassination Records Collection Act, to declassify all documents pertaining to Kennedy’s murder in 25 years. Therefore all documents were to be released in 2017. When the time came for the documents to be open to the public, the media was full of stories about the releases. I was still able to access Bloomfield’s documents as late as November 2017, but with all of the media attention given to the JFK documents release, a decision was made to block access to them. The reason for blocking access to them, using the excuse that they were subject to SCP, was most likely caused by all of the media hoopla in America. On December 18, 2018, LAC released to me over 2,000 documents previously deemed subject to SCP. These files had been reviewed by the archives and deemed to be not subject to SCP. Only 69 documents from the Bloomfield papers were not released because LAC claims they are subject to SCP. A list of Bloomfield’s correspondence that will not be released is in Exhibit 5. A review of the papers that were released did not reveal anything new. The documents found there were the same ones that had previously been considered subject to SCP and held back for 50 years, and these I had reviewed on a number of occasions since 2012. The papers released in 2018 are comprised of letters and cablegrams from Bloomfield to his business associates and other personal contacts. The fact that interesting connections were found but nothing incriminating is not surprising because it appears that Bloomfield was not actually a shareholder in either Permindex or Centro Mondiale Commerciale. His role with these two companies was to protect the interests of certain other shareholders who may have been from the class of the Power Elite. If he had dealings with Director Clay Shaw, or was aware of the company’s intelligence connections, he did not include these documents with the papers he donated to the archives. A review of the correspondence in Exhibit 5 also reveals that important Permindex and Centro Mondiale Commericale figures such as Georges Mantello, Joseph Slifka, Hans Seligman and others, do not appear as recipients on the list of 69 documents that will not be released. For a long time Bloomfield has been the object of suspicion on many internet forums, and also in some books. Some have insinuated he was the mastermind behind the creation of Permindex, which has allegedly organized a few assassinations. These rumours began during the Jim Garrison investigation. Garrison had been given articles written about Permindex by writers like Ralph Schoenmann and the late Paris Flammonde. But Garrison, for whatever reasons, never brought this information up at the trial of Clay Shaw. After the acquittal of Shaw, a man named David Copeland, using the alias of William Torbitt, wrote a pamphlet called Nomenclature of an Assassination Cabal. This pamphlet began to circulate widely in the research community. And it was here, for the first time, that both Bloomfield and Permindex were accused of being part of the JFK assassination. In fact, the very first chapter of the pamphlet focuses on Permindex and names Bloomfield as the top supervisor of the plot. As Jim DiEugenio, in his book Destiny Betrayed, Second Edition notes, there are many, many scholarly problems with this pamphlet, one being that its few references do not check out. Years later, in 1981, Lyndon Larouche—in an issue of Executive Intelligence Review written by Jeffery Steinberg and Peter Goldman—published at length about Permindex. Again, Bloomfield was a central focus of that long essay. For the most part, author Michele Metta thankfully does not go that far. He does not accuse Bloomfield of being the leader of an assassination team, but the evidence does indicate that he made some skewed assumptions about Bloomfield’s role with Permindex. He also raises some suspicions about him because he corresponded with the late George H. W. Bush. In his book, he states that Bloomfield was the founder of Permindex. But he does not supply a source for the statement. Without evidence from the author to support it, we need to look to the Bloomfield papers for an answer. What does Bloomfield have to say about his relationship to Permindex? In a letter from Bloomfield to J. Metzger dated April 8, 1960, he informs him: “…I am not the Treasurer of Permindex but am acting solely in the capacity of lawyer for certain shareholders.” (Exhibit 611 ) Who these shareholders are, he does not tell us, but we now know he is stating that he is not an investor in Permindex. In a letter to Enrico Mantello dated January 21, 1960 he writes: “I would have never undertaken this job if I had not been assured of your cooperation.” (Exhibit 712 ) Those are not the words of a founder, they are a statement being made by a representative. Again it appears from the evidence that Bloomfield is acting on his client’s behalf and does not have a financial stake in Marina Reale. Metta also tries to raise suspicion about Bloomfield’s correspondence with George H. W. Bush, a director of the CIA, who later became both Vice President and President of the United States. His cites as evidence Bloomfield’s connection to Bush, the implication being that since they knew each other, there must be wrong-doing here. He also states that the correspondence between Bloomfield and Bush has been blocked from public access. This is not accurate today. The files are available for public review because LAC only blocked access to those files that they deemed to be subject to SCP. Given that Bloomfield was not Bush’s lawyer, their correspondence is open for review. He also states that the correspondence is “dense”, suggesting that they exchanged many letters. (p.110.) This writer could find only 18 items in Bush’s file and they do not discuss Permindex or CMC, or conspiratorial matters. All of these items can be found in Exhibit 9.14 This does not mean that we can automatically excuse President Bush, or Bloomfield for that matter. It is simply stating that the evidence is not there in these files. 1 Jim Garrison, On the Trail of the Assassins, Warner Books Edition, New York 1991, p. 101. 3 Library and Archives Canada, Louis M. Bloomfield, MG 31-E25, Container 29 File 16, General Business Correspondence 1979. 4 Gladio in Italy was part of a larger group of secret armies under the command of NATO that operated in different countries using different names. In Denmark it was called “Absalon”, in Norway it was called “ROC” and in Belgium it was called ‘SDRA8.” They were set up by the CIA and MI-6, and their job was to act as a stay-behind orce that would operate in countries that might be occupied by the Soviets after an invasion of Western Europe. Their objective was to help local resistance movements in occupied territories, evacuating pilots who were shot down and sabotaging enemy supply lines. This network was modeled on the British Special Operations Executive that sent soldiers behind enemy lines during World War II to fight a secret war. Daniele Ganser, NATO’s Secret Armies: Operation Gladio and Terrorism in Western Europe, Frank Cass, London 2005, pp. 1-2. 5 Metta’s source for this document is CIA. HSCA Segregated CIA Collection, (microfilm—reel 17: Ruiz-Webster), Memorandum: Subject—Trace results on persons connected with Centro Mondiale Commerciale (World Trade Center). NARA Record Number: 104-10181-10114. The document in exhibit 2 was sourced from The Black Vault website. 6 On p. 8 of Metta’s book is a link to a website that contains documents provided by the author. One of the documents shows that Clay Shaw was on CMC’s board of directors. 7 Library and Archives Canada, Louis M. Bloomfield, MG31-E25. 8 Philipps v. Librarian and Archivist of Canada, Date: 2006-11-14, File numbers: T-1517-05. A copy of the Court’s decision, including the facts of Philipps’ case and legal issues can be found on the Federal Court’s website. decision, including the facts of Philipps’ case and legal issues can be found on the Federal Court’s website. 10 John Kowalski v. Guy Berthiaume, Librarian and Archivist of Canada, File numbers: T-381-18. While documents have been released, the facts of this case and legal issues has not been published on the Court’s website. 11 Library and Archives Canada, Louis M. Bloomfield, MG 31-E25, Container 23, File 1, Letter Book 14, 1960. 12 Library and Archives Canada, Louis M. Bloomfield, MG 31-E25, Container 23, File 1, Letter Book 14, 1960. 13 Library and Archives Canada, Louis M. Bloomfield, MG 31-E25, Container 23, File 3, Letter Book 16 1960-1961. 14 Library and Archives Canada, Louis M. Bloomfield, MG 31-E25, Bush, George (Sr.)—Correspondence 1976-1984, Container 16, file 1. 15 Library and Archives Canada, Louis M. Bloomfield, MG 31-E25, Container 19, File 1, Letter Book 3, 1953-1954. 16 The LaRouche Political Cult: Packaging Extremism A case study, Anti-Defamation League of B’nai B’rith, New York, Spring 1986, p.2.